We are ISO 9001:2008 certified company. 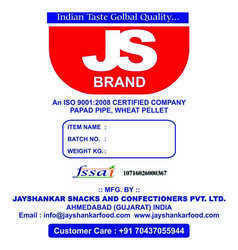 Established in the year 1997 we, “Jayshankar Snacks And Confectioners Pvt. Ltd.” are one of the proficient manufacturer, wholesaler and exporter of a wide range of Extruded Snacks and Pellets. Our offered product range comprises of Potato Fryums, Dried Pellet, Fry Pellets and many more. All of our products are widely appreciated for their quality and tastes. There are many other products in our catalogue that shall cater to the needs and demands of the customers. 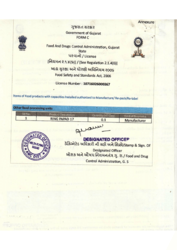 We have taken care of all the quality aspects of manufacturing food products and these are as per the food standards. This range can be availed from us in tangible packagings for keeping the food products safe. Quality ingredients have been used in the making of each product. The taste has also been take care of at each step and checked for quality. We have added preservatives only where required and in a minimal amount, in order to keep the tastes of the products consistent from the packaging till the usage date. Our team of professional workers have ensured a smooth production process at the infrastructure and have been dedicatedly engaged in the process. They are provided with the best and most advanced machines and other faculties in order to carry out the manufacturing of these pellets in a qualitative manner. Used as daily time snacks, these products are preferred for their tastes and quality. The ingredients used in the making have been procured from the most reliable market vendors. Manufactured in various shapes and sizes, the snacks are of premium consistency. A wide customer base has been in demand of our products. We cater to a sprawling client base due to our wide production capacity with complete ease. Our company has gained immense recognition and has established itself under the mentor ship and guidance of "Mr. Narendra Patel". He has the required understanding of the market sources and has been widely influencing the customers. Our mentor has been engaged in guiding the organization towards success and a new motivational path for enhancing the quality and production consistency. A wide and sprawling infrastructure is nothing with out proper facilities and equipment and we completely took upon the cause of developing for ourselves a sophisticated infrastructure facility. This whole of the infrastructure has been provided with best of manufacturing machines and other such machines. Various packaging machines, quality controlling machines, conveyor machines and others are also there in our respective units. Owing to our wide process, we have segregated the whole of the infrastructure in to numerous categorised units. Each of these units is well managed by experts. We have a team of expert professionals who are well versed in the process of manufacturing and wholesaling a wide range of pellets. They have been hired by our firm for their prior industrial experience in the same field. Having ample of experience, these professionals made the most justified usage of all the facilities and advanced equipment availed to them. Our workers are versed in bakery products, in making high quality food products and know how to give them a standard composition for a lasting taste. We have regularly updated our whole team over any sort of up gradation in the process and on any sort of new inclusions. Established in 1996, we are one of the leading exporters of Extuder Snacks, led by a visionary entrepreneur Mr. Shankarbhai Patel the enterprise is truly integrated to the envisioned spirit. His dream for Jayshankar Snacks and Confectioners Pvt. Ltd. is touching the zenith and the expectations are growing at the same time. We have earned a respectable position all over the world by providing best quality and hygienic products to our discerning customers, guided under the supervision of a well experienced designer Mr. Narendra Patel. Our success has been mainly due to the dedication of our workers and our unfailing commitment to customer satisfaction. We source only those products that our customers prefer as this helps us to become more market friendly. Our State-of-Art technology assures standardization in our offerings and hence a delighted customer and consumer response. Jayshankar Snacks and Confectioners Pvt. Ltd. are highly regarded for quality, taste, nutrition, convenience, and value. Our products have been well appreciated all over the world by our clients. We have introduced snacks in design of toys… to make it appealing to Kids. Our snacks can serve as favorite time pass for kitty parties, best accompaniment to beverages like tea, coffee, cold drinks, hard drinks. They also serve as a yummy starter. We aim to extend our base of clients in the overseas market as; this will help us develop a global presence. Established in 1996, we are one of the leading exporters of Extruded Snacks, led by a visionary entrepreneur Mr. Shankarbhai Patel. The enterprise is truly integrated to the envisioned spirit. His dream for Jayshankar Snacks and Confectioners Pvt. Ltd. is touching the zenith and the expectations are growing at the same time. We have earned a respectable position all over the world by providing best quality and hygeinic products to our discerning customers, guided under the supervision of a well experienced designer Mr. Narendra Patel. Our success has been mainly due to the dedication of our workers and our unfailing commitment to customer satisfaction. We source only those products that our customers prefer as this helps us to become more market friendly. Our State-of-Art technology assures standardization in our offerings and hence a delighted customer and consumer response. 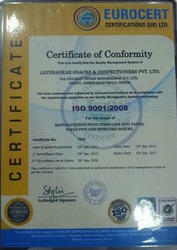 Jayshankar Snacks and Confectioners Pvt. Ltd. are highly regarded for quality, taste, nutrition, convenience, and value. Our products have been well appreciated all over the world by our clients. We have introduced snacks in design of toys… to make it appealing to Kids. Our snacks can serve as favourite time pass for kitty parties, best accompaniment to beverages like tea, coffee, cold drinks, hard drinks. They also serve as a yummy starter. We aim to extend our base of clients in the overseas market as; this will help us develop a global presence.